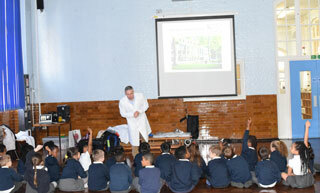 Every year in March, sciences and their importance in our everyday lives are celebrated during British Science Week. Promoted by the British Science Association, it provides an opportunity for people of all ages across the UK to take part in science, engineering and technology events and activities. 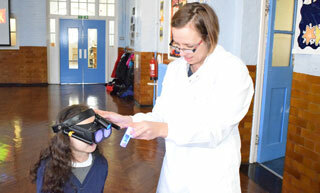 This year, to celebrate British Science Week, we took our Glow in the Dark Science roadshow to Tower Bridge Primary School in Southwark. 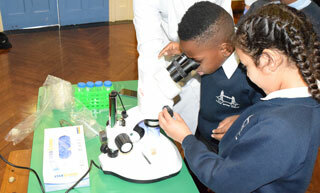 Throughout the day, nearly 200 pupils aged 5 to 11 took part in a series of practical andl fun activities around the use of fluorescence in modern biomedical sciences. At the beginning of each session, the scientists introduced themselves and asked the questions that drive our research: What abilities does our brain provide us with? How is the brain put together? And how can we best study brain cells and their myriad of connections? Fluorescence holds the key to being able to see, follow and study these brain cells in the laboratory. Fluorescence is visually appealing and can easily and immediately be detected using readily available equipment. Our Glow in the Dark Science project makes use of a number of 'activity stations' where children learn the basics about how fluorescence works, can observe glow-in-the-dark fish and fruit flies, try their hand at keyhole surgery and manipulate a human anatomy brain model. The workshops were delivered by researchers from the Centre: Rachel Jackson, Tristan Varela, Kinga Bercsenyi, Florence Giger, Thanu Poobalasingam, Louisa Boddy, Andy Symonds, Albert Sanchez Aguilera Lopez, Katherine Treves and Clemens Kiecker.